Welfare Ain’t What It Used to Be! This came in an email from my friend Norm. I’m copying it in it’s entirety. It’s a wonderful illustration of generational welfare and entitlement mentality, prejudice against whites and more of the “Katrina victimhood”. Pay special attention to the emphasized sections–they are extremely telling. This story can be found here at Snopes as well. Part of it is indeed satire; however the photographs of her “slummy house” are real as is the person and her attitude/racism. Sharon Jasper has been victimized. Sharon Jasper has been rabidly wronged. 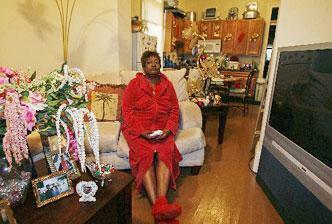 She has become a Section 8 care case “the victim of ever changing public housing policies. Sharon Jasper has spent 57 of her 58 years dedicated to one cause and one cause only, and has nothing to show for her dedicated servitude. She has lived in Section 8 housing all but 1 of her 58 years. It was a legacy passed down from her parents who moved into Section 8 housing in 1949 when she was six months old. She has passed the legacy down to her children, but fears they may have to get jobs to pay for the utilities and deposits. Sharon directs the reporter’s attention across the street to Duncan Plaza where homeless people are living in tents and states that, ‘I might do better out there with one of these tents.’ She further lamented her sentiments about her situation,’ I might be poor, but I don’t have to live poor. Filed under: Katrina, Miss Beth, Section 8, Sharon Jasper, Welfare |	Comments Off on Welfare Ain’t What It Used to Be!